If you’ve never heard of Gary Shteyngart, Lake Success is the book to win you over and send you to Goodreads to add his entire back catalogue on your to-read list. With five books to his name, could someone explain where this mind, this force, has been hiding? Shteyngart reads like an impossibly fun combination of Jonathan Franzen’s intelligence and social commentary, layered with the emotional and comedic sensibilities of Teddy Wayne. 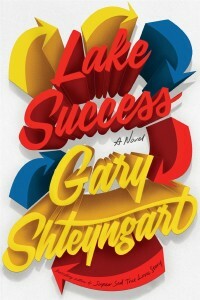 While Lake Success wouldn’t be categorized as airtight perfection, it is far more entertaining and enriching a novel than we should ever deserve. Its consistent hilarity and insight will so astound you that whatever you read next will inevitably be a letdown. Barry Cohen is the kind of hedge fund billionaire who maintains his excessive wealth regardless of whether he earns his clients an impressive dividend or squanders their life savings. He is thrown into a crisis of identity when his wife, a considerably younger beauty of Indian descent, offhandedly describes him at a dinner party as lacking an imagination and soul. It doesn’t help that their two-year-old son was recently diagnosed with nonverbal-level autism, a verdict they delayed discovering and still can’t quite fully accept. Appalled by his wife’s accusation and daunted by the current state of his family, he manically embarks on a several-month Greyhound trip to rediscover the country he has for so long ignored—including the eventual goal of finding and reconnecting with his college sweetheart. By some impossible feat of gymnastics, Shteyngart makes enjoyable the thought process and adventures of a privileged capitalist vulture, in part thanks to the Don Quixote lens through which Barry perceives his surroundings and interactions. When rolling into Baltimore and its abandoned rows of low-income housing, all Barry sees (with utter enthusiasm) is the real-life set from The Wire. When crossing paths with a street drug dealer, he sees a young entrepreneur worthy of his sage tutelage. Even if Barry’s enthusiasm is genuine, there’s no escaping the shocking disconnect between his billionaire bubble versus the gritty existence of ignored Americans around him. His warped intrapersonal perception hits its most tragic depths in reference to his autistic young son, whom he refers to only as his “little rabbit.” Endearing as its intent may be, it’s perfectly representative of Barry’s reluctance to grant equal human status to those beneath his standards. The ironic kicker: Barry is just as “guilty” of the manic, obsessive autism behaviors that he ostensibly distances himself from. He gushes endlessly about his extensive collection of watches, each of which could cover the price of a summer home. As a loner child, he preferred spending his time writing fun computer code experiments on his Commodore 64. He eventually broke into a social life by deciding upon an opening line, then thinking of ten possible responses someone could give him, then ten more responses to each of their responses, and so on. While this mechanized conversation matrix may have worked to make friends in college and billions of dollars in adulthood, it did not result in the development of a true heart. Now, with all his privileges and advantages stripped away, Barry finds himself woefully unequipped to serve as a father and good-faith citizen. Shteyngart’s writing is a masterclass in pacing—creative writing undergraduates, take note. The book opens with one of the more effective lead paragraphs you will ever encounter, and hits the ground running. Every plot-based “question” to eventually be “answered” is never dragged on longer than necessary; Barry gets to that checkpoint and is already setting up the stage for what’s next. Shteyngart never cheats the reader, offering rich continual rewards to those who persist. It’s especially impressive because a “road trip plot,” much like a “hometown reunion,” is an artificial plot-driver of far too many books and movies, an unimaginative way to give characters something to do. Yet all of Barry’s misadventures, across multiple landmark American cities, never feel like a random array of unconnected encounters. Whether it’s with a crack dealer, a former colleague, or his college sweetheart, each segment features a fascinating glimpse of his past and in turn his identity, without ever flooding you with tedious backstory. Lake Success very much wants you to know that it is a “now” book, attempted via extensive textual integration of Trump references. Barry’s Greyhound journey begins around the time Trump descends that infamous escalator, and the narrative proceeds with direct references to the key debates, campaign promises, and certain leaked hot mic tapes that defined that election cycle. As sad as it is to point out, these Trump references feel non-essential, as if they were an afterthought inserted only upon initial completion of the core narrative. The story of an insecure yet narcissistic billionaire, trudging through a country with which he is completely out of touch, would have been just as applicable had it been set ten or twenty years ago. As a result there’s no uniquely Trumpish themes that justify the extensive inclusion of hyper-current political content. Shteyngart perhaps wanted to provide big picture context for the Trump-voter types found in the cities Barry explores. The problem is, these folks are off Barry’s radar because he’s a heat-seeking missile toward Bernie-voter-types as a means to boost is own perceived cultural credit. The mismatch never adds up, leaving the political summaries oddly misplaced, especially because they comprise the least comical portions of the story. If there’s one other minor disappointment, it’s that the story’s final results were set into motion long ago, rather than being the product of any realization, growth or agency in the present tense. Barry in particular maintains similar measurements of narcissism and delusion throughout each phase. But hey, who says all protagonists need to shed every flaw and save the world for a happy ever after? Perhaps it’s especially fitting for Barry, as a symbol of the titan banking industry which to this day maintains its “too big to fail” status, with no incentive to reduce its vicious vulture behavior. Still, let not this chilling through-line detract from the fact that Lake Success is riotously funny from start to finish, and if it fails to be distinctly Trump-esque, it is nonetheless brutally American to be sure.